Following an initial announcement back at the Mobile World Congress this year, the social giant is now rolling out its new 2-step mobile payment flow which allows developers to include it in their Facebook apps via Facebook’s Payment API. 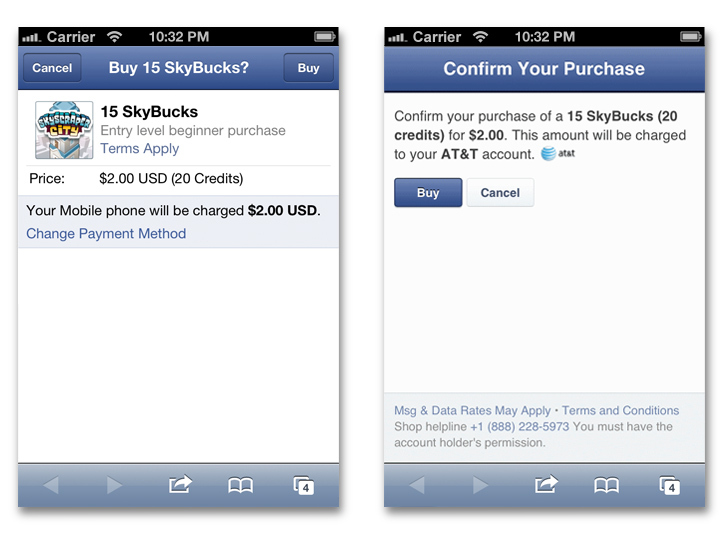 Basically, game developers building on the mobile web have been using Facebook Payments to monetize their apps. The new mobile payment flow is current available for selected carriers in over 60 countries. The payment flow is simple. Users who want to pay for a virtual or digital good in a mobile web app open the payment dialog and confirm their purchase. This payment flow requires no typing and looks like this.